This year's key GCSE and A-Level examinations have been timetabled to take into account the Muslim holy month of Ramadan, exam boards have said. The Joint Council for Qualifications said many core exams had been set for before Ramadan starts on 6 June, but there had been no large scale changes. It has consulted with Muslim groups on the issue since the month of fasting moved into the exam season in 2013. Ramadan shifts slightly each year in relation to the Western calendar. It follows the Muslim calendar and, this year, runs from 6 June to 5 July. 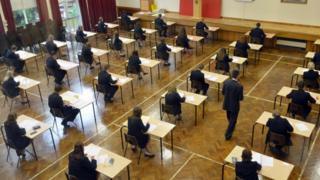 Pupils in England, Wales and Northern Ireland will sit GCSEs and A-levels between May 16 and June 29 this year. During Ramadan month, many Muslims fast during daylight hours, pray more and attend special services at mosques. Some will not eat or drink water from dawn to dusk. And head teachers have voiced concerns this may have a negative effect on exam performance. Michael Turner, director general of the JCQ, which represents exam boards, said it consulted on the provisional examination timetable every year, and considered comments from a wide range of stakeholders including religious groups, schools and colleges. An Ofqual spokeswoman said the exam regulator had taken part in discussions about "the timing of Ramadan this year and we support the steps JCQ and the exam boards are taking with respect to the timetabling of exams this summer". Secondary head teachers in the Association of School and College Leaders are planning to meet Muslim groups to see how they can work together to meet the challenge of the clash. "The guidance will be non-prescriptive and will not advise families or students on how they should address the question of fasting during Ramadan, which we agree is a matter for the individuals concerned along with parents, carers and faith leaders. "School and college leaders are very keen to work with communities to ensure young people are able to observe Ramadan without any detrimental impact on their examinations."